The squirrel’s head has changed. Now, it’s not actually that unusual to find slight differences when you compare two or more copies of the same print in detail. Prior to the widespread introduction of lithography in the 1820s, most caricature prints were created by engraving an image onto a copperplate which was then covered with ink and pressed onto paper. Unfortunately, the very thing which made copper such a good material for engraving on, namely its softness, also meant that it was ill-suited to be continually squeezed under high pressure in a printing press. Over time the stresses of the printing process would gradually flatten out the engraved lines, making it more difficult for them to accept ink and thus eroding the quality of the finished image. To counteract this process, the artist (or another engraver) would often touch-up the plate midway through the print-run in order to re-emphasize the bits that had started to fade. This resulted in the introduction of small variations in the thickness of lines or the location of stippling, hatching and similar features. However all of that is worlds away from what we are seeing here. This is a deliberate decision to invest significant time and effort in erasing the head of a principal character from the plate and replace it with that of a different person. In order understand why this might have happened and the significance of the Bedford Squirrels, we must turn to the history behind the image. The first edition of this print was published on 16th November 1795. Two weeks earlier, George III’s carriage had been pelted with stones by a mob shouting republican slogans as it drove through the streets of London. The British government, fearing the country was teetering on the brink of a revolution, responded by issuing a raft of new legislation designed to crush all forms of extra-parliamentary political activity. The freedom of the press was curtailed, most basic civil liberties were suspended, and the definition of treason was broadened to such an extent that it became impossible to articulate any form of opposition to the political status quo without running the risk of prosecution. The severity of the measures shocked the liberal members of the Whig party who coalesced under the leadership of the MP Charles James Fox. They immediately set about mobilising a campaign for the new laws to be repealed, and a public meeting was convened at the Crown & Anchor tavern in London on 11th November 1795. The meeting was chaired by Francis Russel, 5th Duke of Bedford and leader of the Whig peers in the House of Lords. Bedford delivered a bilious attack on the government which ended with a motion for “meetings of the people… [to] be immediately called to consider this important subject… for the purpose of petitioning Parliament against the said bill, or any other measure which might tend to infringe the just rights of the people of Great Britain.” The effect of the resolution was immediate and resounding. The next day a crowd of some 100,000 people assembled at a political rally on the open fields just beyond Islington to listen to radical members of the London Corresponding Society set out their programme for political reform. These meetings were replicated on a smaller scale up and down the country and within a few days of Bedford’s speech, petitions were pouring into Parliament demanding that the new laws be repealed. The political prints that Gillray was producing around this time were resolutely hostile to the notion of extra-parliamentary political activity, typically linking it to violent republicanism and the agents of France. It’s even possible that he was paid to produce them as part of the concerted campaign of pro-government propaganda that was orchestrated by the young Tory MP George Canning. 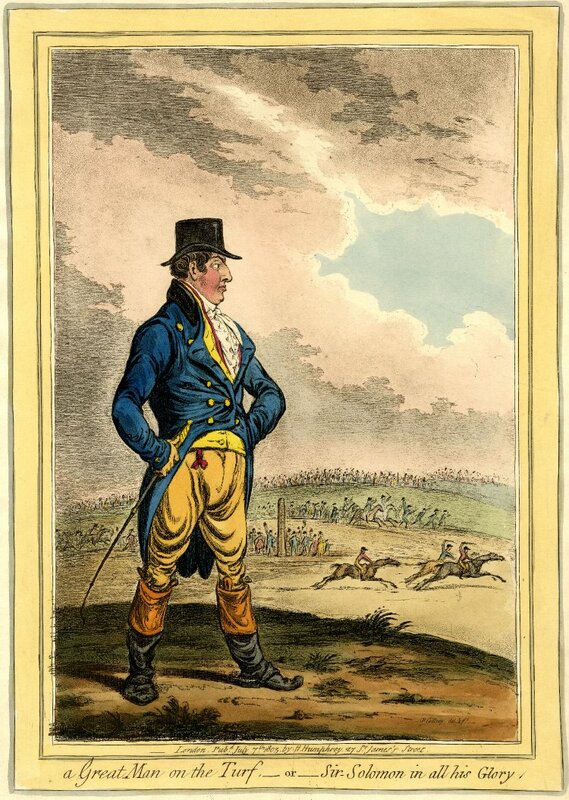 We know that Canning had been introduced to Gillray at some point during the summer of 1795, and that he would go on to commission prints from the artist before eventually offering him a secret pension in order to forgo the pleasure of publishing anything which was hostile to the interests of the government. 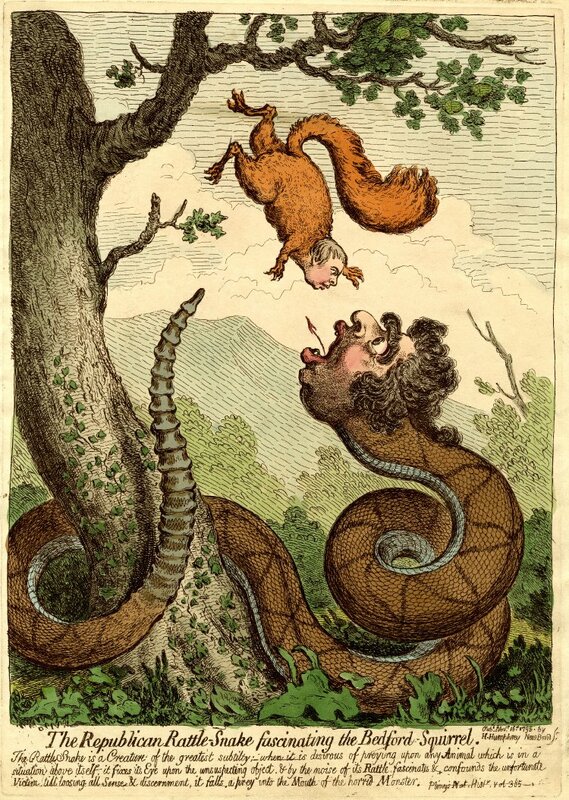 In The Republican Rattle-Snake… Gillray launches a personal attack Charles James Fox and the Duke of Bedford who are accused of being the orchestrators of public unrest. The image is particularly wounding to Bedford, who is portrayed as a hapless rodent who has been mesmerized by the power of Fox’s oratory and is about to be swallowed whole for his troubles. It can be seen as rebuke, chastising a member of the aristocracy for turning his back on his peers by encouraging the rabble to involve themselves in political matters and risking a revolution which would surely end up destroying him as well as his enemies in the Tory party. In the second plate Bedford’s image has been replaced with that of his younger brother John. 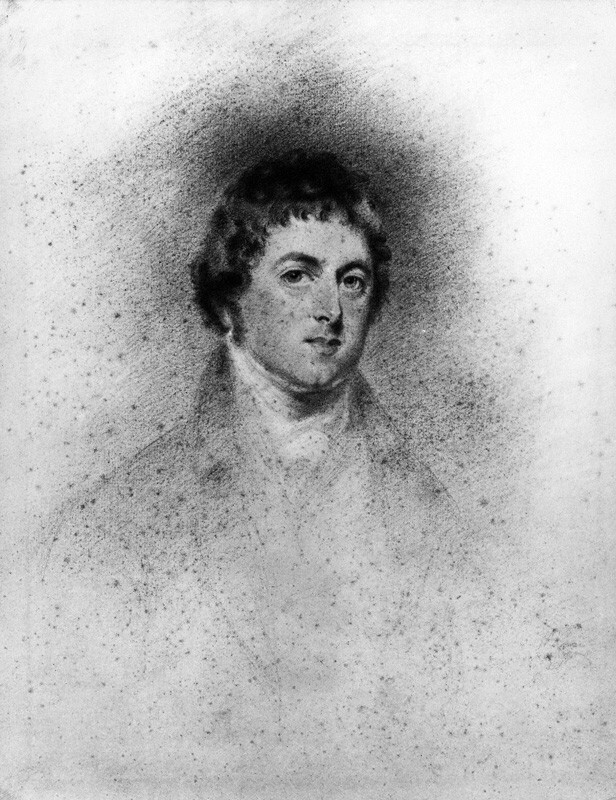 John Russel would go on to become the 6th Duke of Bedford following his elder brother’s death in 1802 and would serve as a minister under Fox in the short-lived ‘Ministry of All the Talents’ between 1806 and 1807. But in 1795 he was still a relatively unknown figure whose political activities had been limited to a short stint serving as MP for Tavistock between 1788 and 1790. 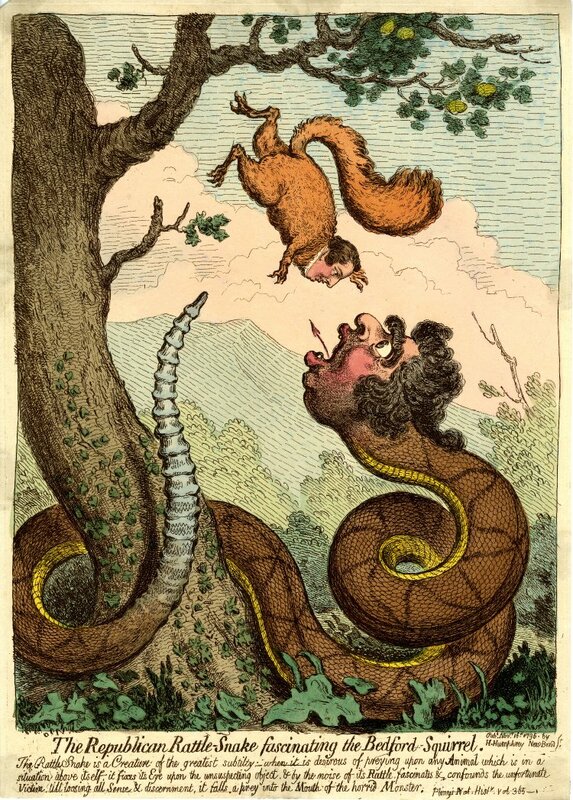 It’s possible that Gillray produced both version of The Republican Rattle-Snake… simultaneously in 1795, but this seems unlikely given the relatively obscurity of John Russel at that time. My own view is that Gillray revisited the copperplate at some point after 1806, by which time John Russel was serving in government and constituted a target worth attacking, and re-issued an updated version of the print. This would not have been uncommon, as the Whigs sudden return to power after an absence of almost a quarter of a century prompted a number of London printsellers to dust off and reissue anti-Foxite plates that had been in storage since the 1780s and 1790s. It was in effect an easy way for artists and publishers to generate further profits from their existing stock of copperplate. This theory would also explain why the first state of The Republican Rattle-Snake… cannot be found among the many posthumous reissues of Gillray’s prints – the image of Francis Russel having been permanently removed from the original plate and replaced with that of his brother. This pen, ink and watercolour caricature by Isaac Cruikshank will be going on sale in the UK in a couple of weeks time. Cruikshank, along with notable contemporaries such as James Gillray, Thomas Rowlandson and Richard Dighton, produced numerous watercolours during his lifetime. 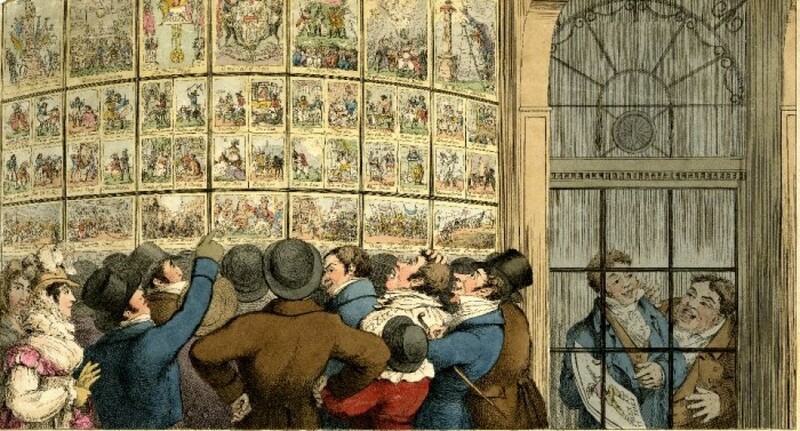 These paintings seem to have served two purposes: firstly, as a means of proofing designs for potential publications prior to the investment in copperplate and other materials required to translate them into print; and secondly, they served a small but lucrative market of wealthy collectors who were interested in buying original works by their favourite satirists. Cruikshank’s originals usually offer a toned-down version of the themes that he frequently explored in his satirical prints – a love of London life, sociability, and a tendency to occasionally veer towards the saccharine and the sentimental, being apparent in many of his paintings. 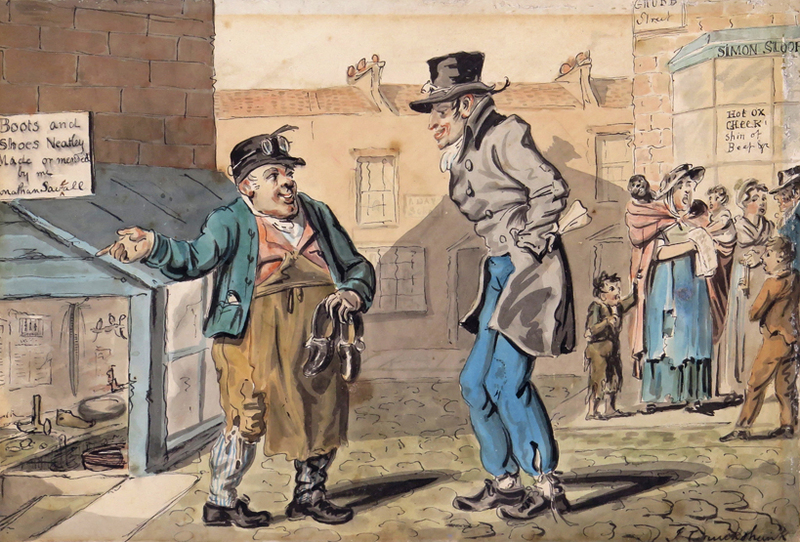 The scene here is set somewhere on Grub Street, a locality made famous by its association with satirists and hack writers in the first half of the eighteenth-century, but which by Cruikshank’s time was also becoming a byword for the deprivation and the down-and-out in general. It shows a hearty cobbler, Nathan Saveall, touting for business in the street. He gestures over his shoulder to his ‘shop’ which is little more than a hole in the street with a jerrybuilt timber and glass shed thrown over the top of it. The man he is addressing looks nonplussed, his slightly battered appearance suggesting that he hasn’t the money to buy whatever Saveall is selling and the rolled-up manuscript sticking out of his pocket hinting at the possibility that he is an impoverished writer. In the background a small crowd has gathered around the window of a cookhouse. It includes a ragged ballad singer who bawls out one of the songs from the sheaf of broadsides in her hands while simultaneously tending to her three young children. I must admit that if Cruikshank is making a joke here then its meaning is largely lost on me. I can only think that if humour was his intent then this image was conceived as a realistic counterpoint to the heavily idealised images of urban poverty presented in popular prints such as Francis Wheatley’s Cries of London series. It’s a nice picture nonetheless and something of a rarity to the collector.